D test is performed for the detection of inducible clindamycin resistance that means that some isolates of Staphylococcus aureus are in vitro resistance to erythromycin and susceptible to clindamycin. However they have ermgenes that encode resistance to the macrolides and lincosamides. The gold standard for diagnosis of inducible resistance is the genotyping. However this is not cost effective in clinical laboratories therefore CLSI guidelines recommend D test on S.aureus isolates that are resistant to erythromycin and susceptible to clindamycin. Erythromycin disk is placed in close proximity (20 mm) to a clindamycin disk. As erythromycin would act as an inducing agent isolates expressing erm gene will grow in resulting in a D-shaped zone around the clindamycin disk. 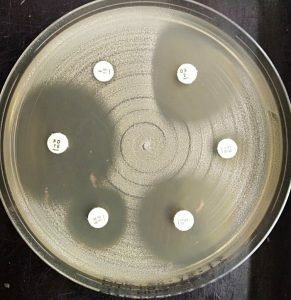 These isolates should be reported as resistant to clindamycin.